Product #55515 | SKU ASU650SS-480GT-C | 0.0 (no ratings yet) Thanks for your rating! With SLC caching and advanced error correction technologies to ensure optimised data performance and integrity. 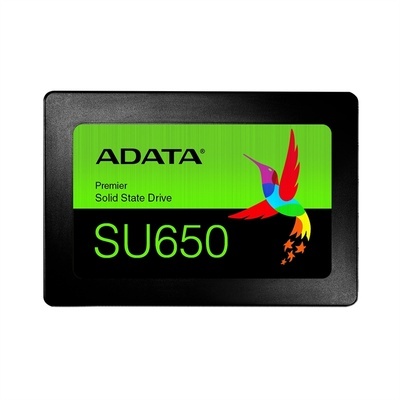 The Ultimate ADATA 480GB SU650 Ultimate SATA III 2.5" Internal SSD implements 3D NAND Flash and a high-speed controller, offering capacities up to 960GB. It delivers read/write performance up to 520/450MB/s and greater reliability than 2D NAND SSDs. The SU650 features SLC caching and advanced error correction technologies to ensure optimized data performance and integrity. For those who want to experience a clear PC upgrade, the SU650 is an excellent choice with a great cost-performance ratio.